One of the most challenging decisions parents make is which daycare facility to enroll their child. With so many day cares, many parents spend countless hours researching, touring and interviewing different facilities. Even after you have done your due diligence and found what you believe to be the safest daycare for your child, accidents can still happen. Whether intentionally or accidentally, negligence occasionally occurs. In these cases, your family may find itself in a legal dispute. 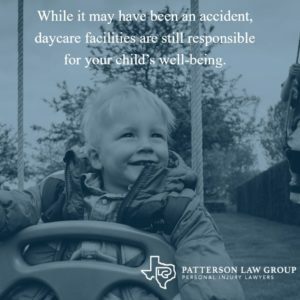 Just as you are there to guide your children through life, Patterson Law Group is here to guide and support your family through this unfortunate circumstance. According to the Centers for Disease Control and Prevention (CDC), one of the leading causes of death of children between the age of 1 and 4 is accidents or unintentional injuries. Day cares are responsible for the safety and well-being of your child. If an accident occurs on their watch, the team at Patterson Law Group is ready to help your family heal and get compensated for any injuries or damages. While these may be accidents, the daycare facility is still responsible for your child’s well-being. Regardless of the circumstance, the team at Patterson Law Group will do whatever it takes to demand a thorough investigation into the injury of your child. 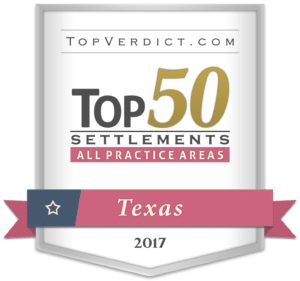 We will not rest until your family receives all due compensation for medical expenses and/or punitive damages. 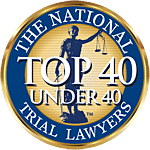 The last thing your family needs to do after your child suffers an accident is navigate the obstacles of the legal system. Take the time to heal, and we’ll get work on your behalf. What If It Happens To Your Child? Being aware of the potential accidents that can occur at day care facilities is the best way to make informed decisions about where to send your child. Knowing the warning signs, and getting a sense of the environment and the staff can help reduce the likelihood of your child suffering an injury. No matter how diligent you are, though, your child could still fall victim to daycare neglect. If your child does suffer an injury, what should you do next? After seeking medical attention for your child, your next call should be to Patterson Law Group. We will help you navigate the legal process & provide your family with clear and concise council. From assessing the situation to involving authorities and filing all necessary documentation, our team will be your family’s advocate. If your child has suffered an injury due to daycare neglect, your family has already been let down. But where others have failed, we are here to right the wrongs for you and your child. 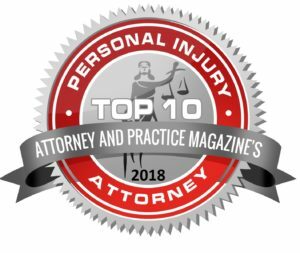 Our approach not only takes into consideration your claim and circumstance, but provides a level of compassion that is often hard to find among lawyers. We specialize in fighting for families who need a voice; we rise above the legal jargon and speak for our clients’ children with courage and persistence. 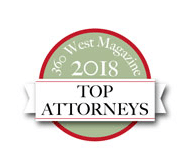 Our unique approach includes a pre-litigation team, constant communication through cloud-based case file management, and a commitment to providing value-added services. The team at Patterson Law Group is here to help your family get through this difficult time. If you’re feeling bombarded with paperwork, phone calls and medical bills, give us a call and let us take on the burden. We treat each case with the time and attention it deserves, and will be with you every step of the way. We know this has been a lot to handle and will do everything we can to fight for your child. Contact Patterson Law Group by completing the form to the right or by calling 817-784-2000. Shaken baby syndrome is a serious brain injury that results from forcefully shaking an infant or toddler. The syndrome is recognized by both doctors and law enforcement as child abuse. The brain damage resulting from shaken baby syndrome is often permanent. Does signing a daycare liability waiver affect my case? Many daycare waivers include clauses that state a parent forfeits any right to sue if the waiver is signed. However, courts have traditionally held that it’s against public policy to relieve daycare providers of liability if a child is hurt in their care. Therefore, a waiver will not affect your injury case in most situations. A personal injury attorney can assess your case to better determine if a waiver affects daycare liability in your situation. How do I prove the daycare is at fault for my child’s injuries? Duty: The daycare had a legal obligation to you and your child and that obligation was violated. Causation: Your child’s injuries were sustained as a result of the daycare’s breach of duty. Foreseeable: The daycare provider should have been able to foresee that the injury could have occured. Proof: Evidence will be needed to support how the injury occurred and how the daycare provider was at fault for the injury. If my child has special needs, does that affect a daycare injury case? Disabilities can increase the risk of injury and reasonable supervision is expected for children with behavioral or physical disabilities. A daycare’s duty to supervise special needs children extends beyond the professional standard of care for other children. Failure to adhere to a higher standard of care may constitute negligence on behalf of the daycare provider.